The most simple and cheap sheet metal covers are used often by Housewives for canning food for the winter. This is because they are suitable for all kinds of workpieces. The efforts to fill the pantry was not in vain, it is important to choose quality cover, with a lacquered finish not only outside but also inside. No the best recipe will not save berries or vegetables intended for winter storage if you will break the seal and sterility of the jar. Sterilization is more or less clear – glass jar without damage should be well washed and dried, or treated with hot steam. However, the choice of lids for the hermetic blockage of the cans requires a special approach. Despite the fact that the glass cover is already the last century, some Housewives are convinced their guaranteed safety, environmental friendliness and reliability. The benefits of this type of lids is that they do not require sealing machines and can be used more than once. Each glass cover is equipped with a special clamp. However, to find in the market today glass is practically impossible. In place of the glass that does not require seaming tool, came another kind of screw cap. Although it is not really reusable, not only the so-called, but also used. However, it requires appropriate jars with screw thread, but both of different sizes available for sale. Universal screw cap convenient, but skill its use will be required. If tightening the resulting imbalance, to ensure the safety of the workpiece is impossible. It is important to tighten being careful not to pinch and not to disrupt the air valve. Since it is not always possible to catch the right amount of force, experts advise not to close screw caps marinated vegetables. 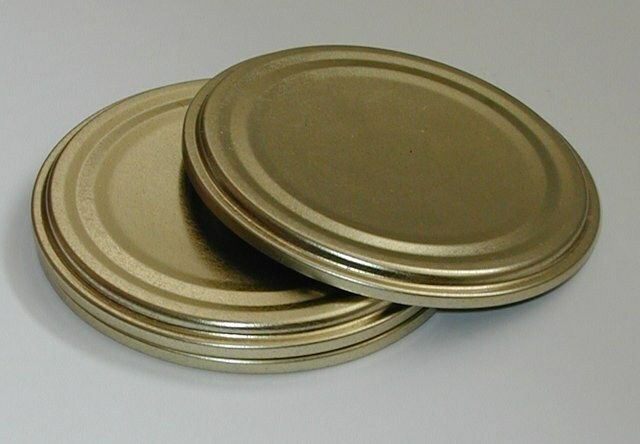 Russian manufacturers produce normal lid tin gray color, called "white" and cover yellow leather. You can meet a lacquered aluminum cap. Can be used as those and others, but the lacquer finish provides protection against oxidative reactions, which may be subject to the cap in contact with the marinade, where there is vinegar. It is therefore important to rolling the jars with pickles, tomatoes were used cover, covered with a food varnish, not only outside but also inside, where it really matters. Internal coating can be silver or pearl. This means that the food caused the lacquer or mother-of-pearl enamel, which protects against oxidation. In appearance to distinguish between a lacquered tin lid from aluminum is almost impossible. To recognize the material, you need to take her in his arms. Aluminum is a little easier and smoother, which can be felt only picking up a capping machine. Quality tin lid should weigh 0,14 gr. have inside the tight rubber ring and have more than two ribs. To determine the weight of the cover, and took it in my hands, is unlikely, but out of curiosity home you can experiment.